Review posted June 30, 2017. Brilliance Audio, 2016. 7 discs, 8 hours, 48 minutes. Trevor Noah, current host of The Daily Show was born in South Africa during apartheid. Since it was illegal for people of different races (as defined by the authorities) to have sexual relations, his birth to a black mother and white (Swiss) father was proof that a crime had been committed. He couldn’t be seen in public with either of his parents. To walk in the park, they’d get a colored woman to walk with him, and his mother would pose as the nanny. At his grandmother’s house in Soweto, Trevor wasn’t allowed to go outside, because if police saw him, there could be serious trouble. This book was especially good to listen to, since Trevor can speak the various African words correctly. His mother made sure he learned English first, but he learned many other African languages as well. He has some interesting observations about how you can be part of any group if you speak like they do. Though he did have trouble fitting in. There are interesting observations on that, too. 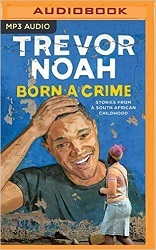 This book helped me understand how to this day, Trevor Noah’s outsider perspective helps him get to the heart of things. This book is abundantly entertaining. The author is a comedian and shows us the funny side of so many things, while at the same time giving us perspective on things as wide-ranging as racism, poverty, going to church, and domestic violence. This is an eye-opening and amazing story. And it's all true. Mostly, it's about Trevor's life growing up in South Africa as apartheid fell. There are lots of laughs mixed in with more sobering truths. I highly recommend this audiobook.